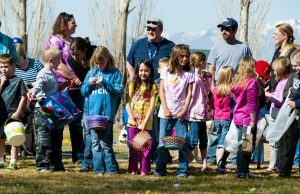 The City of Cedar Hills and the Youth City Council presents the annual egg hunt on Saturday, April 20, at Heritage Park, 4425 W. Cedar Hills Drive. The hunt is for children ages 10 and under and will begin promptly at 10:00 a.m., weather permitting. Bring your cameras for pictures with the Easter bunny, and come join the fun! The Youth City Council also presents the seventh annual Flashlight Candy Dash & Pizza Party for tweens ages 11-14 (Grades 5-8). Bring a flashlight or headlamp; basket, bag, or bucket; and your friends for a night of candy dashing on the Cedar Hills Golf Club driving range. Meet at the Community Recreation Center on Saturday, April 20, at 8:00 p.m. Immediately after the hunt, there will be a youth pizza party and dance in the recreation center that will last until 10 p.m.